Blanket Octopus are 4 species of the genus Tremoctopus. They are found throughout the world's tropical and sub-tropical oceans, from the surface to moderate depths. 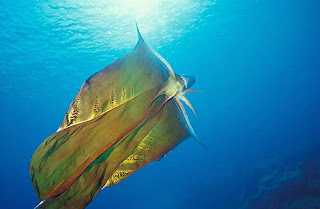 I usually think of octopods crawling around on rocks and such but the Blanket Octopus is pelagic, living life out in the open ocean with no need for coasts or the sea floor at all. And of course, "living life" is one of her top priorities, so she requires some kind of defence against whatever predators she may come across. She has no octopus ink, so this is when her Giant Security Blanket of Doom makes its dramatic appearance. A female Blanket Octopus might get to about a metre or 2 (3.3 to 6.6 feet) in length, but her first 2 pairs of legs are extra specially long. Attached to them is a huge span of webbing that is normally hidden away. In times of need, this drapery is unfurled, spread out and left to billow in the water. It's like curtains on a dark and stormy night, when you really ought to close those windows. This makes her look far larger and more threatening than she actually is, hopefully scaring off any predators. If it doesn't seem to be working so well, bits of her blanket can even detach from the rest to act as a decoy. Quite the bag of tricks! But it doesn't stop there! Or rather, it didn't start there. Even as a tiny youth, this Blanket Octopus was a brawler. 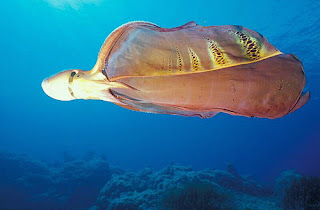 Blanket Octopus are immune to the stings of the Portuguese Man o' War and, not being one to waste a good opportunity, she grabs it by the long and tendrilly. In other words, she rips off a few of their tentacles and wields them like whips. Poisonous, stinging whips. Yowch! Like other cephalopods, male Blanket Octopus have a special arm modified for reproduction. It stores sperm and is offered up to the female. 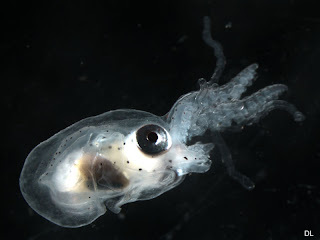 It actually detaches from the rest of the male's body and crawls up into her mantle. His special tentacle really has a mind of its own! She can now produce some 100,000 eggs which she stores in a calcareous packet that she carries around with her until they hatch. The male on the other hand... well, job done. She only wanted him for his special tentacle and he doesn't have it anymore so... he promptly dies. Excuse me while I go practise putting up shelves. Along with the Mimic Octopus, this has always been a favorite of mine! I'm glad to hear it! Also cool because the Mimic and the Blanket have such completely opposite strategies! Could have used a few extra blankets this weekend. I prefer the sort that's a bit less soggy, cold, and filled with stinging jellyfish tentacles. Hey, Comment1, I've got a new applicant for your delightful menagerie here! 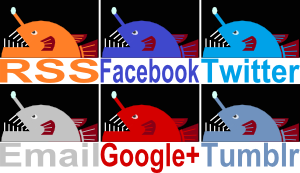 What do you call a shark that eats polar bears and uses luminescent parasites growing out of its eyeballs as lures? Well, there are many, many appropriate things to call a monstrosity like that but science calls it the Greenland Shark (AKA: the weird cousin that Great White never talks about). Oh and also its flesh is neurotoxic. Wait a minute, how did we get this far without anyone making a "wet blanket" pun about the octopus? I'm sorry, I'll stop spamming now. We can all do with some nice blankets! And yes, definitions of "nice" may vary. This shark sounds good! I'll check that out. Thanks, Crunchy! Oh wow. I might have to add "Octopersons" to my vocabulary!